Lady Mama July 24, 2009 at 5:53 p.m. 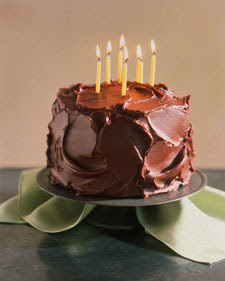 Yes that might be my dream birthday cake too, being a chocoholic, only thing is I might not want to share it! robin July 24, 2009 at 6:06 p.m.
Oooh. That cake looks YUMMY! I am Harriet July 24, 2009 at 6:28 p.m.
Lola July 24, 2009 at 8:38 p.m. Anonymous July 24, 2009 at 8:54 p.m. Please...... My bday is coming up really quickly!!! Lizzie July 24, 2009 at 10:58 p.m.
oh yeah i'll have a piece of that! thanks for stopping by my place earlier :) have a great weekend!! ~Sandy~ July 24, 2009 at 11:07 p.m.
oh y that looks delish! have a wonderful weekend and happy vgno!!! Martha in PA July 25, 2009 at 6:59 a.m. Happy VGNO! Thanks for stopping by! Anonymous July 25, 2009 at 6:02 p.m.
Oh yum! Happy late VGNO! Mandala Michelle July 25, 2009 at 9:08 p.m.
Nice job sneaking in Lola's blog! The frosting on that cake looks amazing. Sarahlcc July 25, 2009 at 11:52 p.m.
Hi! I'm stopping by from The Glamorous Betty Crocker, I think I her through following the cute button from Muthering Heights, anyhoo, I saw your sewing button on The Glamorous' website and I just had to put one on my site! Forget the lemons and lemonades, let's sew! This VGNO looks like fun, it's a weekend thing, so easier to participate when I have more time, I'll have to go check it out. Night Owl Mama July 26, 2009 at 5:23 a.m.
Carolee / Home4ever July 26, 2009 at 8:27 a.m.